I remember feeling so embarrassed in my first group lesson in when I had to solo. Besides the fact I wasn't great at guitar and had just learned the blues scale on my red Fender Stratocaster, I was surrounded by these cool "alternative" type boys in the class and I was this awkward overly laugh-y and perk-y Jr. Higher with watermelon themed braces- not really what you think of as rock band potential. We would do these exercises where everyone would be jamming on certain chords and then whoever was doing their little lead part would noodle over whatever scale we were doing. My first times of making up melodies and licks were not good at all. Like a lot of younger players, I tried to just cram as many notes as would fit in my solos. I felt like I just couldn't get the hang of what I was supposed to do! Then my dad showed me something magical about how he made up an entire solo that sounded awesome with only two notes and it clicked for me that to write a killer solo, all you need to do is think of melodies in your head and play them out on guitar. 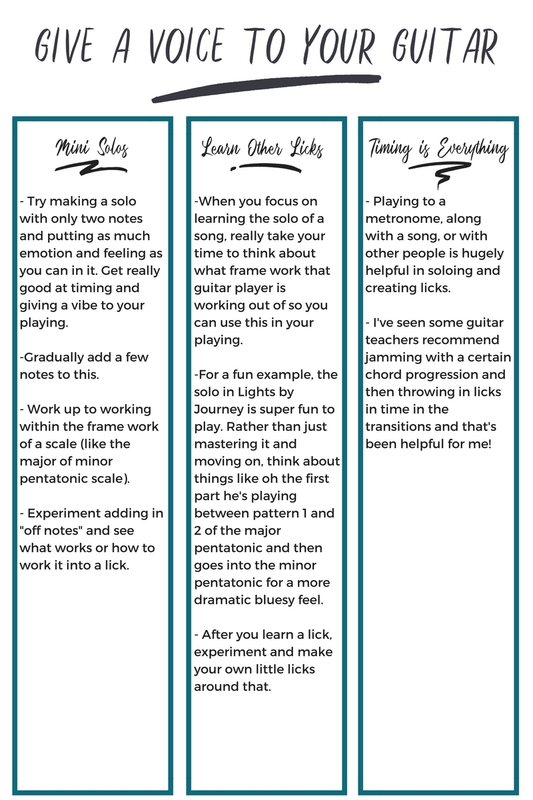 The more scales and techniques you learn, the easier it is to play those melodies out, but you don't need to know much to create a tasteful and beautiful little solo. I tried this technique the next week in my class and my teacher was like "wow, so tasteful!" and I was so excited. Having that guidance and a little pressure in the class was so good for me, so I wanted to pass on some tips of what I learned to you too! Also all the boys in the class became buddies and I'm still friends with some of them today- bonding in the camaraderie!! Here's my top tips for walking through this! Let me know if this is helpful! I would love to hear your thoughts below or if you want me to elaborate on any of these concepts. Thank you so much for reading as always!